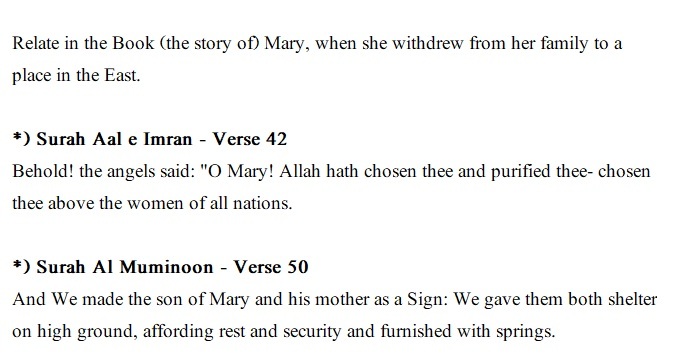 I have mentioned below some of the verses from Quran that mention Mary (Maryam in Arabic and Islamic scripture) the mother of Jesus Peace Be Upon Him. Mary (Peace Be Upon Her) is an honoured figure in Islam and has been mentioned several places in Quran. The verse mentioned below tells us about the time when Mary went into seclusion and how Allah gave her the glad tidings of an obedient and pious son who would become a prophet. "Relate in the Book (the story of) Mary, when she withdrew from her family to a place in the East"
Quran talks extensively about Maryam (Mary Peace Be Upon Her) as there is whole chapter (Surah) devoted to Her in the glorious Book.